This entry was posted on April 2, 2015 at 10:19 am and is filed under Andy's observations, tips on getting published. You can follow any responses to this entry through the RSS 2.0 feed. You can leave a response, or trackback from your own site. Very timely, great advice. I’ll be reviewing a publisher’s contract shortly. Will likely contact Helen to tell me what’s missing! Fabulous article! Definitely sharing with my writing group! You are very welcome, Mom and Cathy. And thank you Andy for helping me reach more writers. Sue, thanks for visiting the blog. If you look at your Viking contract, it probably says that the publisher will register it within 90 days of publication. But check that out just to make sure. Hello colleagues, how is all, and what you desire to say about this article, in my view its in fact amazing for me. I had a contract with a publishing company and when it expired I did not renew with them. It’s been 5 yrs and they are still selling my book. I have seen it in different stores and it’s also now in audo as of 2015. I have not given them permission to sell my book and I have not received any royalties from the sales. Were can I find a good lawyer to handle this for me. 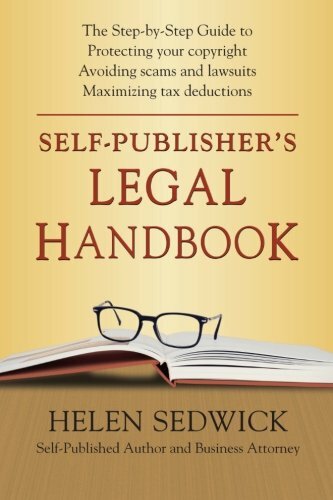 I have read your book “Self – Publisher’s Legal Handbook” and found it quite interesting and informative. I do have one question though; is there a certain type of attorney that specializes in internet and self-publishing law? I live in Florida and the closest thing I have found is attorneys that specialize in copy write law. Calvin, A copyright attorney should have some familiarity with self-publishing, since so many writers are taking that route. Internet law is another story since it covers a wide range of issues from patent to First Amendment. You should check with your local or state bar association to see if they have any referrals. To lower the appearance of cellulite, make sure you exercise consistently. Be sure you job up an excellent sweating once you exercise. Excessive sweating helps expel unhealthy toxins from your system from the epidermis. Exercising also improves your body’s physical appearance by tightening and tightening up, so that you appearance much better even when you have fatty tissue.